Emergency response calls can come in at anytime of the day or night and must dealt with immediately. Firefighters must be expert in getting themselves dressed in the appropriate gear and mounting the emergency vehicles quickly. These emergency calls can involve a host of challenges including structure fires, auto accidents, brush fires and other hazardous situations. “When responding to fire alarms, I determine the route to be taken by the Lady Warren Hose Company #5. On the incident scene, I analyze the extent of the fire, the seat of fire exposures, the size of the building, personnel in the building and make decisions about the best methods of extinguishing the fire and saving lives and property. The Fire Pumper or Engine carries 500 gallons of water for a quick attack on a fire until a dedicated water supply can be established from a fire hydrant. I supervise operations at the fire including the laying out of hoses, directing water streams, determining pressure of the streams and ventilating buildings .The firefighters locate the hydrants and connect the hoses to the sources of water using various tools. They get the hoses in position by dragging, carrying or hoisting them into place” 1st Lt. Kaylyn Strysko told the Rockland County Times. The Halligan is an all-purpose tool for prying, twisting or punching, which is useful in breaching many types of locked doors. The Pike Pole is used to pull down walls to stop a fire from spreading. A thermal imaging camera is a type of thermographic camera used in firefighting. By interpreting infrared radiation as visible light, this camera allows the firefighter to see areas of heat through smoke, darkness or heat- permeable barriers. Stretching the hose to a fire is a team effort that requires coordination. For the hose line to be effective, it must be mobile, which means the crew must spread the lengths they need to advance. After the section of hose is advanced and the nozzleman is ready to open the nozzle, the backup members must move back into position to assist the nozzleman. One member checks that all of the hose has been cleared from the hosebed, because extra hose can kink where is folded causing a water restriction that could affect the fire attack. The pump operator ensures that any hose remaining in the hosebed is cleared before charging it with water. The first hose line should go between the fire and the victims. Usually the front door is the best route to achieve this position, plus the hose line should protect the interior stairs from fire extension. Flow is the volume of water delivered through the hose lines to the burning material by means of the force of the fire pump. The horizontal and vertical reach of the fire stream expands as the pressure is increased. Heat, wind, building partitions and the angle of the stream all have an impact on the stream’s reach. Nozzle pressure is the optimum pressure needed at the end of the hose line for the nozzle to produce an effective stream. Some of the most important functions of 1st Lt. Strysko are to ensure the training and readiness of Lady Warren Hose Company’s personnel. There are locations to practice including parking lots, vacant buildings and the Fire Training Center in Pomona. Training procedures include: removing the right amount of hose from the Pumper, carrying the hose effectively on the shoulder or arm, flaking or stacking the hose line, staging enough hose at the entrance point of the structure, flaking the nozzle and coupling for the lead-line advance, knowing when to charge the line with water and donning personnel protective equipment (PPE), such as the mask, hood, helmet and gloves. “I was born in Haverstraw, went to the local schools and have friends in the area. I was a member of the Girl Scouts and received Silver and Gold Awards. My parents were active helping out in the Haverstraw community. This Hose Company is like a family and we work well together. 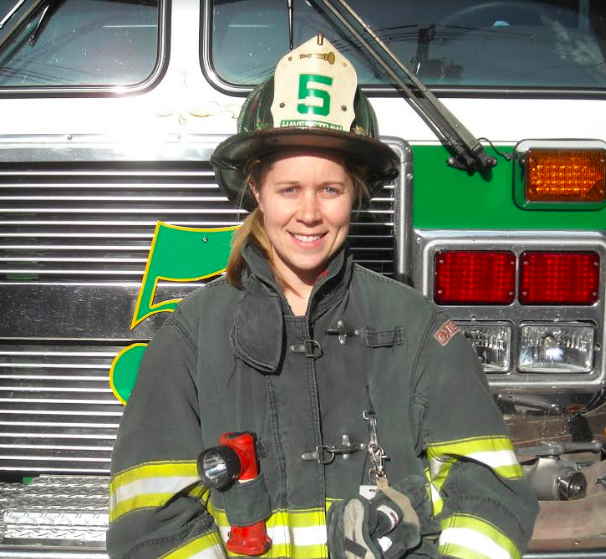 I joined the Hose Company in 2006 and I am the first female officer to drive a firetruck” concluded 1st Lt. Kaylyn Strysko.